My name is Corey, and I’m addicted to bento & back to school lunch making supplies! Please don’t judge… I know I Might Have a Problem. Every time I see a new lunch cutter, or bento box….I just must buy it! I have had several requests in the past couple months to post about the tools I use to make my lunches. The bottom draw of my kitchen island lunch making station. 1. random cookie cutters I used the most. 6. small bentos: All Things For Sale. There is the lovely spice rack that I converted into an extra bento box holder. Then, I keep cookie/sandwich cutters that I don’t use all the time in small tupperwears. Well… there you have it! These are some of the supplies behind the lunch making magic here at Family Fresh Meals. I linked up some of the products to where I bought them, in case you are interested in adding to your collection. I hope you enjoyed the post! Let me know if you have any questions! 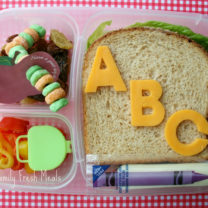 Bento Love: Back to School Lunch & Apple Note Treat! Man oh man… that is a difficult question… I can only pick ONE! I guess it really depends on your situation. 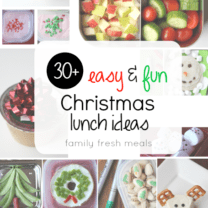 Hands down, the Easy Lunchboxes are a great value, sturdy, both adults and kids can use them, and great dividing sections. The Lock & Locks are not too expensive, and are great for small lunches. So, it really depends on what YOUR situation is. I have 2 children, so instead of buying 2 boxes, I will buy one, see if it is a hit, and then get more. If you are just starting off, you can get a set of 4 Easy Lunchboxes for just under 14 bucks. So I would say that is a good place to start…most bang for your buck 🙂 I hope that helps! Holy crap! You make me feel a little less CRAZY 🙂 I still have to get mine posted. I like how you organized your post. Darn… I was hoping to get an “amazing balls” outta ya 🙂 hahah. Awesome Corey! It’s amazing how addicting these cute little supplies are. 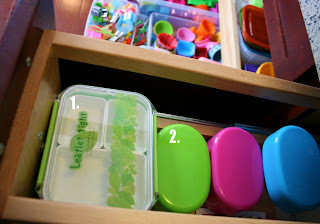 I love your stash and your organization – looks great! Thanks Ludicrous Mama…. since my girls are not eating at school yet, I have not had that problem…but always worried about it. So thanks for the great tips! 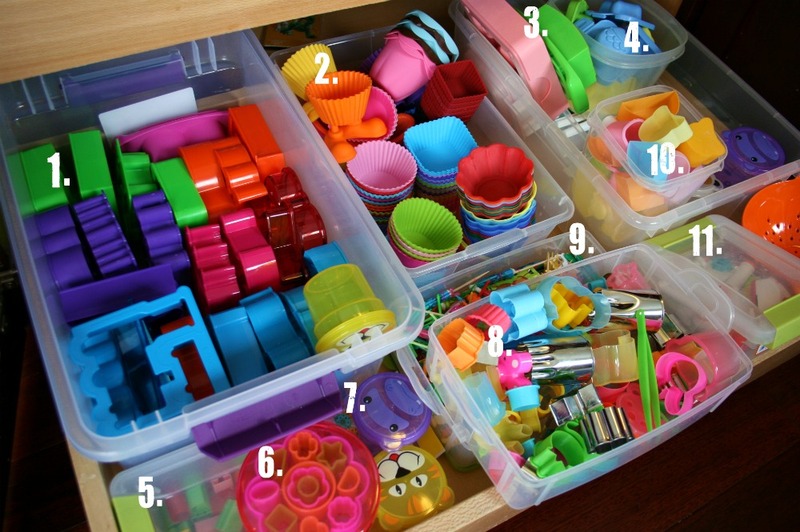 Thanks for this post…I was one of the ones who asked how you store all this. I’m getting overwhelmed. Oh my goodness! I see so many things I do not have and now want..lol Great collection! Wow! An envious collection! Have pinned this!! I can’t wait until my collection is that big. It’s slowly getting there, but it’s nowhere near as big as your collection… yet. What a fun addiction 🙂 And it looks like you keep it so organized, just like your lunches, I love that! Jealous! I want it all! So funny I have 1 dinosaur sandwich cutter and I’m always kicking it around the kitchen drawers. WOW! I have an addiction to Bento supplies too!! But somehow yours seem alot more organised than mine. I have a couple of boxes full and a cupboard.. sneakily buying different things every now and then. Though Australia doesn’t have much bento lunchboxes available.. its nice to see someone else who is as obsessed with Bentos as I am!! But I bet you do yummier bento lunches than I do!! Anyways I am new to all this bento stuff but the kids are totally loving it. My youngest is 4.5 but he is at home during lunch. I still pack him one because he thinks its fun. Anyways my questions is the mini alphabet punches/cookie cutters got terrible reviews on amazon because people couldn’t get the cookies, dough, fondant out of the cutters. I was thinking about buying that set but not being experienced in cooking or baking at all I was worried. Do you have any suggestions on how to get the letters out easier? 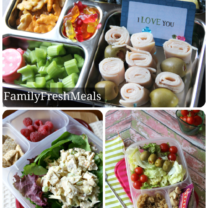 I am so glad to hear that you are loving bento lunch packing! It really is fun to see the smile come across the kiddo’s face when they see their special lunch. 🙂 Yes, any of the alphabet cutters are going to be a little difficult to get the cheese, meat, fruit leather, etc.. out of, because they are so small. but I have had really good lunch with these. Thank you for the quick reply! I was looking at those cutters but wasn’t sure. 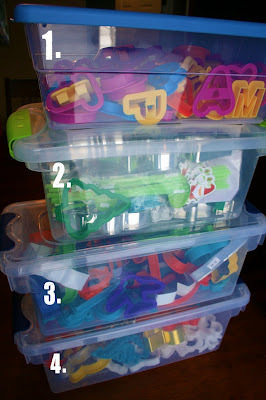 I’ve seen like 2-3 inch cutters but I wanted smaller ones to make words and such without having a ton of cookie or bread or whatever in the lunch box. I have a lot of stuff I want now! LOL Its given me an excuse to get back in the habit of cooking again. It can be frustrating being a single mom and all three of us having different allergies, likes and dislikes. Generally dinner is eat what ever you want (within reason). Kids usually grab some veggies and PB sandwiches while I microwave a meal for myself. I don’t care for PB sandwiches and they don’t care for meat! So when they get home from school I’m getting in the routine of washing their lunch boxes, making something for dinner, cleaning up and making their lunches for the next day. Its given me something fun to do for them when my depression has made it difficult to enjoy play time with them! This is my favorite!! Maybe that’s why I love it!! 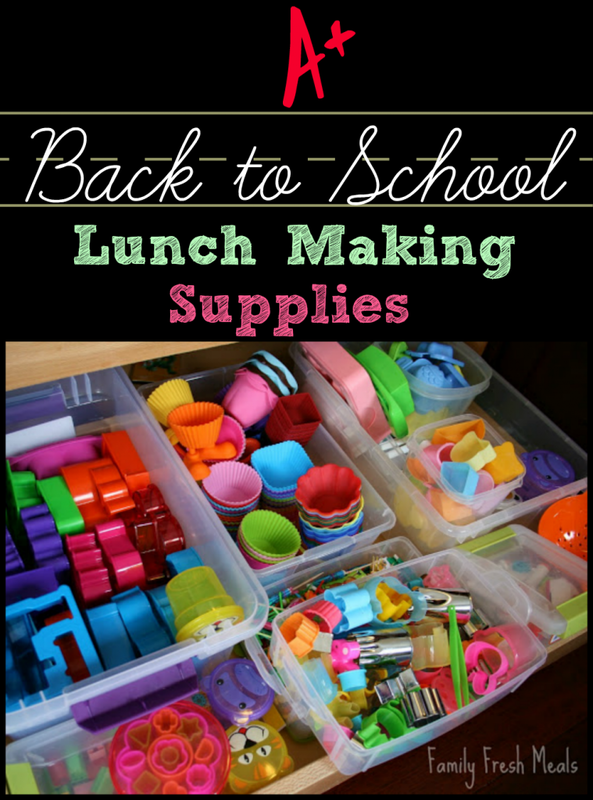 I saw your lunch making supplies on Pinterest and had to see it! Typically I don’t comment on posts and just repin but I HAD to this time…. My name is also Corey… I’ a mother of two boys and I love making creative lunches for them. My boys are only 3 and 1 1/2 right now and I don’t have many supplies yet, but I am sure with a little bit of time I will start collecting. Thank you for sharing some of your fun ideas… I’m sure I will be coming back to see more soon. That is the most ridiculous thing I have ever seen……and I am IN LOVE! I want every one of those amazing bins of goodness!! So jealous! Thanks for sharing!! Hi Corey! Just stumbled upon your blog via Pinterest. I AM in love! Are there any insulated bento-style containers to keep food warm that you particularly like or recommend? This would be for my Kindergartener. So nothing too big. Love all your organizing ideas. I love to pull out my fondant/cake decorating stuff for lunches. 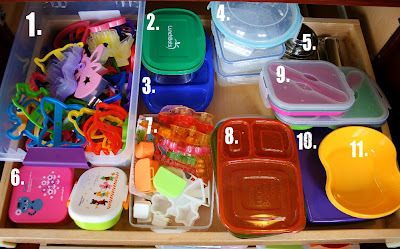 I almost got the Easy Lunchboxes but then I realized that Glad makes the same things for super cheap and they are completely reusable as well. I have also found great supplies at the Dollar Tree. I found a sandwich sized container that also has a corner cubby for dressings or in our case for applesauce for French toast sticks or chicken bites. I was just wondering if you have a favorite store where you go to for fun supplies. I found a lot of stuff on Amazon, but didn’t want to have to pay shipping on such small items. I live near the Wilton factory store, so I was going to check it out for silicone cups, etc. Thanks so much for the fun inspiration!!! SOOOO many fun things. I hope that helps! I might have cried happy excited tears about this. I’m new on our bento journey (still trying to decide what fancy things to purchase even) and I kind of just want to be like you right now!